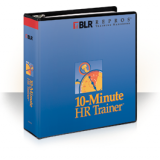 The 10-Minute HR Trainer is the easy way to deliver valuable human resource management training meetings in as little as 10 minutes. It includes everything you need for training- meeting outlines, handouts, quizzes, etc. Put it to work in your organization and stop worrying! For many professional skills and competencies, this 5-volume set can start you in the right direction or complete existing programs that lack a key skill. You get 100 workshops that range from 1 to 3 hours in length. 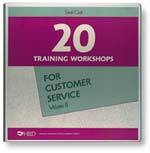 Enhance customer service at all levels of your organization with these two volumes of 20 ready-to-use training workshops. Train your staff to listen with skill and sensitivity. This volume contains 20 ready-to-use workshops including detailed notes for the trainer, handouts, and reproducible participant materials. Each workshop takes 1-3 hours to complete. 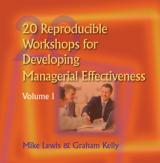 This title contains 20 ready-to-use workshops including detailed notes for the trainer, handouts, reproducible participant materials and a Power Point presentation. 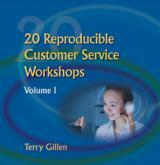 Enhance customer service at all levels of your organization with these two volumes of 20 ready-to-use training workshops. 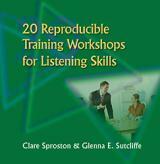 Each workshop includes detailed trainers notes, transparency masters, and participant handouts. All materials are fully reproducible which makes them an excellent value for your training dollar! Make it easy for employees to provide great customer service with this collection of motivating and skill-building activities. There’s no need for a special training facility, no huge costs involved, or no prior training experience required. All you need is a group of employees who are committed to giving customers what they rightfully deserve—excellent service. 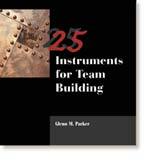 This new collection of instruments provides team building practitioners with tools designed to assist in the development of individuals, teams, and organizations. The instruments range from very simple, self-scored tools, to more complex assessments that provide in-depth information on teams. All of the instruments are fully reproducible which makes them a very cost-effective alternative to in-house development or off-the-shelf instruments. 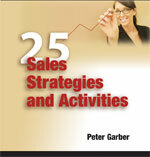 25 Sales Strategies and Activities is a unique training and development tool designed to teach sales professionals how and when to use a variety of proven sales strategies. 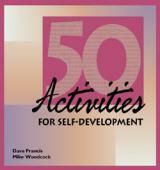 This special offer includes 4 fully reproducible Volumes of assessments. Volumes I and II of Sarah Cook’s Compendium of Questionnaires and Inventories, The Compendium of Learning and Development Quizzes, and 25 Reproducible Instruments for Team Building by Glenn Parker. 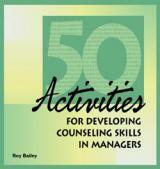 A total of 163 questionnaires are included in this 4 volume special. 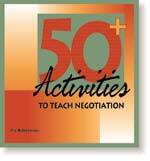 This book contains a variety of fully reproducible exercises to teach and reinforce the skills necessary to be a successful negotiator. Each Activity includes a detailed description of the exercise, the steps to follow, additional resources and lecture notes for the trainer. 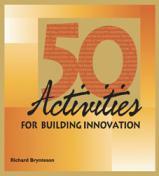 These 50 exercises are the perfect way to get employees excited about the concept of innovation, develop their innovation skills, build an ongoing capacity for innovation and introduce an easy-to-use innovation process. Participants will learn how to do visioning, seek innovations in a certain industry, feel comfortable challenging the norm, generate a large number of new ideas in a short amount of time – and that’s just the beginning. As they work through the exercises, they’ll have fun, learn to think better and be motivated to apply what they learned back on the job. 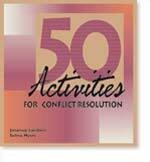 This collection introduces the issue of conflict and its resolution as a part of workshops on management, leadership, communication, negotiation and diversity. 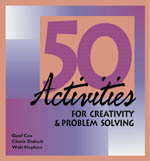 These reproducible activities develop creative thinking, offer new approaches to problem solving, and develop innovative approaches to problems that aren't responding to traditional methods. 50 Activities for Developing Critical Thinking Skills contains 50 fully reproducible training activities to develop quick thinking, creative thinking and analytical thinking skills. 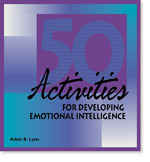 A collection of reproducible emotional intelligence activities perfect for skill-building on self-awareness, emotional control, empathy, social expertness, personal influence, mastery of vision and more. 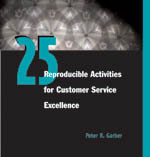 50 fully reproducible activities ranging from 15 minutes to more than an hour in length. Skill development for team leaders, front line supervisors and facilitators includes: Promoting the Organization to Employees, Running Meetings, Diffusing Conflict, Negotiating Vacations, Dealing with Un-motivated People, Managing Gossip and more. Implement successful self-managed teams in your organization. This collection of proven training exercises has been tested and refined in actual team training sessions, and covers all aspects of team development, including mutual goal setting, managing team stagnation, and developing team norms.